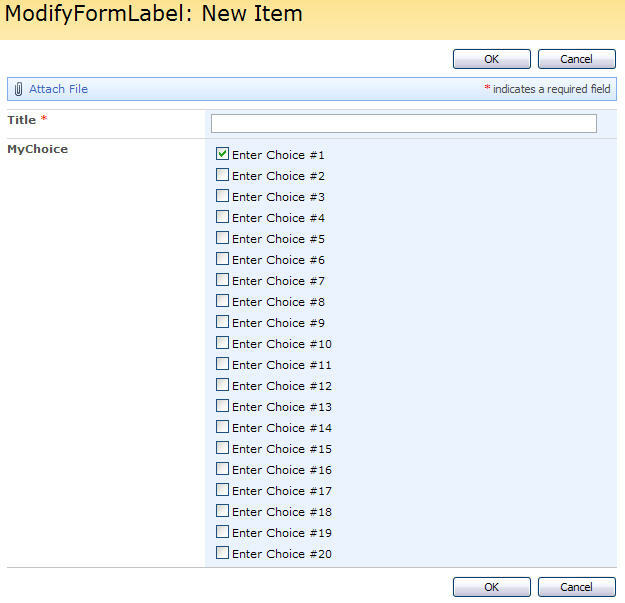 I got a request for a method to edit the form label of a SharePoint form. Basically this i very easy. 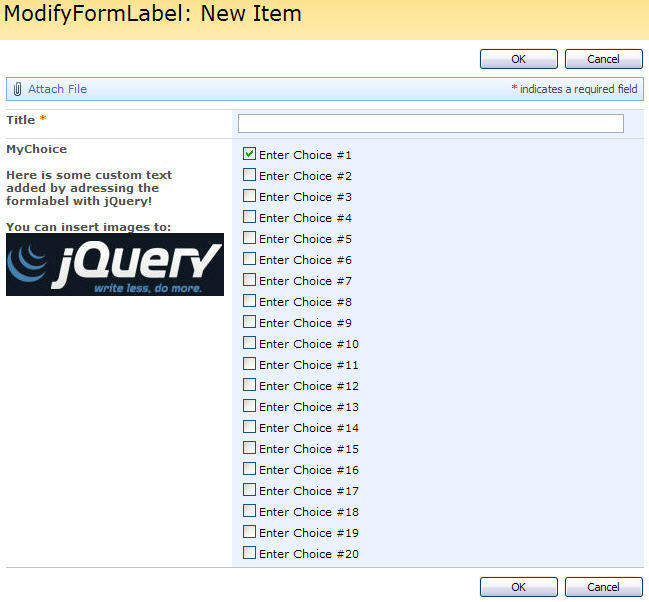 The function init_fields() is a modified version of Erucy’s function for finding fields in a SharePoint form. My modified version uses FieldInternalName rather than DisplayName to locate the fields. 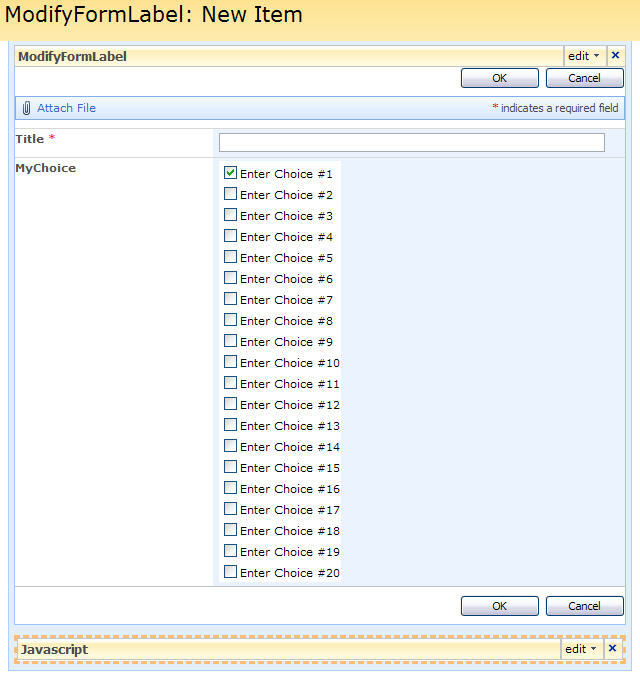 If you want to add individual labels for each of the choices in the choice list- read this post to learn how. Once again, your work in innovative and outstanding! I did find one small bug, but not anything major. When I first implemented the script, I did not make my change to the FieldInternalName. My result was all fields had the same text and image. Once I made the change it only appeared in the named field area. Still all in all great job. Hi Larry, What exactly did you change on the FieldInternalName. I’m having the same problem. Thanks! There’s nothing else to it than use the correct FieldInternalName of your field. If you have the wrong name specified – you get the described result. Hey Alexander, I began implementing this script on a project. I added it to the NewForm with no issues. I added it to the DispForm, and nothing extra is written to the page. does this need to be modified for it to work on the DispForm? Are you sure the CEWP is below the list form?, I have no trouble with showing it on my DispForm. nothing is written to the page. did I miss something? this is what I have. I noticed in the survey no h3 after formlabel. Added you check for list or survey and swapped out the variable. still wont write. can you c what I’m missing here? // Is it a survey? I was confused a minute as this question should have been posted in this article: Add individual label for each choice in multichoice list. is what I cannot get working in the survey. do you mind one more look to see what I missed on that? back to bug you again with labels. I know this is for forms, but is a list view, setup as a boxed view with labels, How can I use this script or what do i need to modify, to add a label for the field label in a boxed view with labels? I found the cell with style .ms-stylelabel, but there must be something else I am missing. I just want to replace the 01 with something else, can this be done? perfect, so all I need to do for each label or question is replicate that function, changing the var for each one, right? You should add some sort of logic to the loop to avoid looping trough all fields more then once, but the answer is yes. Can you change it so it renders in a different css style then ms-formlabel h3? var myNewLabel = "<br><div style='width:190px;color:red;'>Here is some custom text added by adressing the formlabel with jQuery!</div>"
var myNewLabel = "<br><div class='myNewStyle'>Here is some custom text added by adressing the formlabel with jQuery!</div>"
one last thing I forgot to mention. I have found once I starting playing with my styles and formatting I needed to add a width attribute of at least 190px. The amount is a personal preference. I needed to add this width mostly with ordered and unordered lists to prevent wrapping and so it would flow with the rest of the page layout. This also worked well since I had several fields and I wanted a different link on each field.